Single glass sheets can have different energy performance depending on the thickness, color, and composition. The darker and thicker the glass is, the lower it transmits heat. These performances are further enhanced by combining different glass types in insulating units. Insulating glass is composed of well sealed, two or more glass layers held together with metal spacer filled with air. The unit’s insulation performance depends on the metal spacer type and thickness, gas injected (air, argon, or other non conductor gas), and glass color & type (transparent, tinted, coated, or laminated). The level of insulation increases when glass thickness and air space increase. 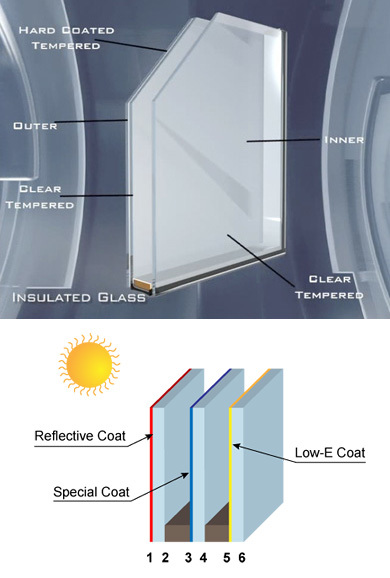 When the glass is tempered, laminated, and replaced by reflective coat and “Low-E” coated units, the insulation level increases thus lowering energy consumption for heaters and air conditioners. We manufacture insulating glass dimensions up to 2.25 x 3.20 with unit thickness up to 60 mm and combine all of the above factors to reach customer required performance for: solar control, thermal insulation, UV blockage, sound insulation and resistance to thermal stress. In case of structural glazing application, we have a special unit for adhering and firming of the glass with the aluminum section. With the infinite number of possibilities and products of insulating glass, please refer to our technical department with your inquiries. Insulating glass is used in glass for vehicles, decorative and architectural applications.